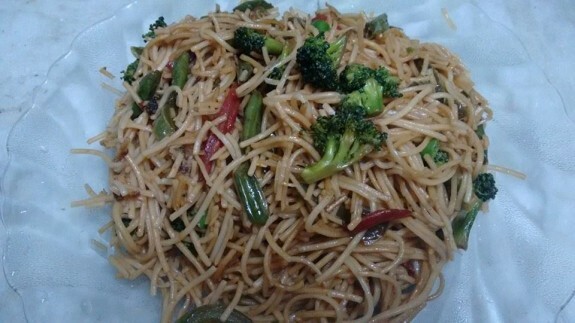 Plenty of vegetables make this Noodles dish too much tasty as well as healthy too. Try this recipe easy to cook quick recipe at home and make your family surprise with this Chinese dish. 1. Boil Noodles in sufficient water with little oil. Drain and Cool the noodles. 2. Heat oil in a pan and add onion slices. Stir it for 2-3 mins. 3. Now add carrots, capsicum, broccoli, bean and cabbages and stir fry all the vegetables for another 3-4 mins. Stir and toss continuously. 4. Add Noodles, soya sauce and white pepper powder and cook couple of minutes on high heat as Chinese recipes always cooked in high heat. Toss it continuously. 5. Add spring onions and mix well. 6. Serve hot with Chilly Paneer or Chilly Chicken as side dish.